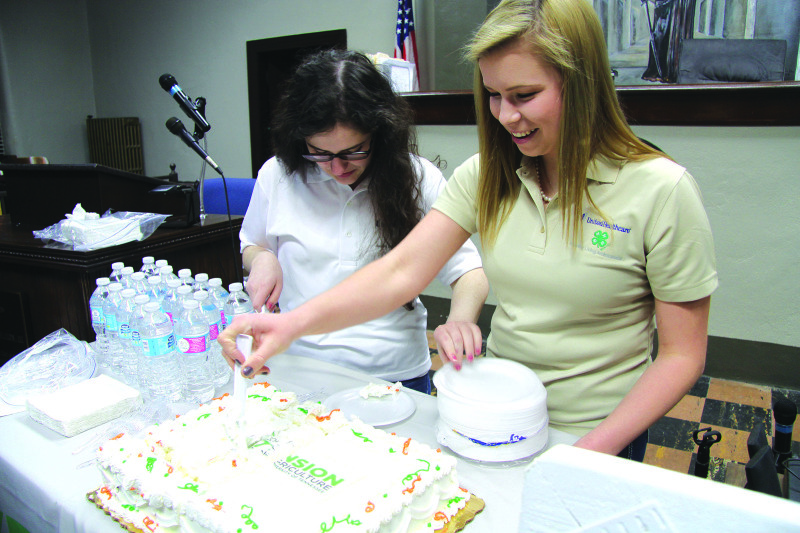 Bringing it around... 4-H volunteers Elizabeth House and Leah Hyatt divy up cake following Cannon County's Commission meeting. March is University of Tennessee Extension Month! All 95 counties across the state are celebrating the state's 105-year-old Extension program. Along with many other programs offered this month, the Cannon County Extension will be celebrated on the Square in Woodbury on March 18 from 3-5 p.m. Great food, games and door prizes are planned as well! What is Cannon County's oldest and largest industry? The answer is simple: Agriculture. A general type of farming is practiced with a good balance of crop and livestock production in Cannon County. Playing an important role in that is the UT Extension Service with its emphasis on the 4-H Club work. That history dates back to 1918 when H.T. Andrews, the first agriculture demonstration agent, wrote Cannon County was very much to itself due to natural conditions and the lack of railroad connections. Andrew's reports listed breeds of animal now uncommon to Cannon County like the OIC (Ohio Improved Chester) hogs and Poland China swine and Southdown and Shropsire sheep. He was happy to report that beef cattle were all of the Hereford breed and Jersey was the common dairy breed. In those days, corn cost 25 cents a bushel to produce with an average of 50 bushels per acre yield. Andrews introduced soybeans to the farmers of Cannon County in those days, telling them they were good to eat. In those early days, Cornelia Laughry and Mary E. Doney, canning specialists, worked locally. From 1920-1929, Cannon County was without extension personnel. C.W. Robinson was hired in 1930 and was the first extension agent to draw a salary from county sources. It was Robinson who began the push to expand farming locally. Over 500 acres of land were terraced along with 20 terracing demonstrations of farms. The raising of family pultry and sheep flocks, home orchards and gardens were encouraged. His goals included one good breeding sow on each farm to insure a home meat supply and some to sell. Every community had a 4-H Club for boys and girls. An important highlight of Robinson's tenure was a first-place livestock judging team in a district contest with seven calves entered in a show in Nashville. O.R. Holley, agricultural agent, started a wool pool, pushing prices from 3 to 5 cents a pound. The first contracts were let for tobacco and wheat acreage. The Armour Cheese plant was built and opened in 1935, creating a new market for dairy products. Meanwhile, home agent Jean Treanor worked with farm women to up the production and sale of eggs with prices rising from 8 cents a dozen to 18 cents. Jean encouraged store owners to sell paring knives for peeling potatoes and flower sifters to make household jobs easier. She also taught 4-H boys and girls to cook by letting them fix their breakfast at school 4-H Club meetings. Miss Treanor also taught farm wives how to improve their kitchens. Several families have their first sinks made out of fuel cans and kitchen cabinets made from recycled apple and orange crates. She also helped launch expansion of Cannon County's white oak basket making. Baskets commonly sold for 25 cents each, until she mailed one to the New York and received $15. World War II marked the next significant increase in local farming interests. Extension Agent J.S. McMahan pushed dairy cattle and organized war bonds, Civil Defense and salvage drives. Fifty acres of tomatoes were grown for a canning factory in Manchester. More than 200 mattresses were made by Cannon County families from 1941 to 1943 while Mary Neal Alexander was home demonstration agent. Victory gardens were plentiful. Pressure cookers made canning safer and easier despite an occasional explosion. Over the years, the goals of the Cannon County Extension program have changed with agriculture remaining the top industry in the area. According to the Census of Agriculture, there are 302 farms in Cannon County with beef cattle with sales of cattle and calves totalling $9.7 million. Other livestock numbers include four dairy farms with 165 cows, 124 farms with hogs and pigs. Cannon County is currently ranked 27th in beef production, 28th for hogs and 46th for horses and ponies. While the number of dairies has dropped considerably, the remaining operations have grown larger. For example, the Vickers' dairy is milking in excess of 400 head of Holstein cattle. 1-65; William Warren, 1965-72; Frank Smith, 1972-75; Noble Kearney, 5-79; John Basinger, 1979-1996; and Bruce Steelman, 1997-present. The following have served as home economics agents: Cornelia Loughry, 1918; Mary Doney, 1918-19; Jean Treanor (Adams-Blankenship), 938-39; Emma Lou Cox, 1939-40; Jennie Mae Mitchell (Adams), 1940- l;Mary Neal (Alexander), 1941-43; Kathleen Rauscher (Bratten), 1943-Betty Profitt Bell, 1950-56; Margie Jowers McFerrin, 1957-62; Helen Reagan (Hawks), 1962-64; Carlene Etter Tenpenny, 1964-67; Faye Bickford, 1967-69; Rebecca Murray, 1970-87; Myra Cowell, 1987-88; Anita Dodd, 1988-91; Rebecca Bugg, 1991-97; Carla Youree, 1998- 2012 and Shavon Ward, 2013-present. The best-known 4-H agent for Cannon County was Clayton Glenn, who was hired in 1957 as Cannon County's first full-time 4-H agent. Glenn held that post until 1961 when he became Agriculture Agent and County Director. Eugene Bryan assumed the role of 4-H agent followed by Albert Warren, Frank Smith, Noble Kearney and John U. Basinger. Heath Nokes held that post until he accepted the county director post in Warren County. In 2014 Sarah Malone became the current 4-H agent for Cannon County.